An Oral Drug for Treatment of AMD? The potential for this proposed treatment option could be significant for many patients and their caregivers. Age-related macular degeneration (AMD) is a leading cause of severe vision loss. In the United States, the estimated number of people with AMD is expected to more than double, from 2.07 million at present to 5.44 million by 2050.1 Although there is no treatment shown to prevent AMD, and no available treatment for the advanced dry form of AMD (geographic atrophy), the treatment of wet (neovascular) AMD was revolutionized by the introduction of intravitreal anti-VEGF agents a decade ago. • Standard of care treatment of wet AMD typically requires long-term intravitreal anti-VEGF injections at regular intervals. • X-82 is an orally administered small-molecule tyrosine kinase inhibitor derived from a cancer drug that inhibits VEGF and PDGF receptors without the toxicities of the parent drug. • A safe and effective oral agent that reduces or eliminates the need for intravitreal injections could be an attractive treatment option. Intravitreal anti-VEGF agents do a remarkable job of preserving and even improving vision in patients with wet AMD, but there is always room for greater improvement. For example, an effective oral treatment could reduce the need for intravitreal injections, thereby reducing the infection risk associated with injections and decreasing the burden of frequent trips to the office for patients and their family members who typically accompany them at each office visit. This article explores the only orally administered dual inhibitor of VEGF and platelet-derived growth factor (PDGF) in development for the treatment of neovascular AMD. AN ORAL TREATMENT FOR AMD? Following promising preclinical experiments and a phase 1 study, X-82 (Tyrogenex) is being investigated in a double-masked, placebo-controlled phase 2 study as an oral treatment for patients with wet AMD.2 X-82 is a small-molecule tyrosine kinase inhibitor derived from sunitinib (Sutent, Pfizer), a drug that is approved for the treatment of advanced renal cell carcinoma, gastrointestinal stromal tumors, and pancreatic neuroendocrine tumors. Compared with sunitinib, X-82 has a shorter half-life and accumulates less in tissues. Preliminary studies of intravitreal injections of PDGF-blocking agents in conjunction with intravitreal anti-VEGF therapy have demonstrated the potential of this combination for the treatment of wet AMD.4 Oral X-82 provides dual inhibition of VEGF and PDGF via systemic distribution, which may allow it to efficiently target bilateral disease with fewer injections. In vitro and animal experiments showed that X-82 is a potent inhibitor of vessel proliferation and provided proof of concept of its potential in retinal disease. Experiments in human umbilical vein endothelial cells showed vessel growth inhibition at low concentrations (approximately 50 nM). X-82 was tested in a rat model of choroidal neovascularization (CNV), wherein a reconstituted basement membrane preparation (Corning Matrigel, Engelbreth-Holm-Swarm) was injected into the retina and the resulting area of induced CNV was measured over time. Daily oral dosing of X-82 at 10 mg/kg prevented the growth of CNV and reduced its area by 80% compared with positive control in test animals. In a second disease model, ischemic retinopathy was induced in mice by an oxygen-rich environment. Retinal neovascularization was reduced by more than 70% in mice dosed with X-82. A phase 1 study of X-82 enrolled 35 patients with wet AMD.4 This was an ascending repeated-dose study. A total of six dose regimens were studied for up to 6 months (50 mg every other day and daily; 100 mg every other day and daily; 200 mg daily; and 300 mg daily). Most patients in the study had heavily treated refractory wet AMD (ie, they had not achieved a dry macula despite frequent anti-VEGF injections). After a good safety profile was seen at lower doses, six treatment-naïve patients with wet AMD were enrolled and treated at higher doses. Patients were examined every 4 weeks, including assessment of BCVA using ETDRS eye charts and of retinal anatomy with spectral-domain optical coherence tomography (SD-OCT). Patients received intravitreal anti-VEGF treatment if their macular thickness increased by 50 µm or if they experienced a 1-line decrease in visual acuity. Twenty-five of the 35 patients completed the full 24-week treatment period. Most maintained or improved vision (ETDRS letters) while receiving X-82. The mean improvement in BCVA was about +4 letters. Of the patients who completed 6 months, 60% (15/25) did not require any further anti-VEGF injections. Over 6 months, these 15 patients had a mean BCVA improvement of 5.3 letters. The proportion of patients who did not require rescue intravitreal injections trended upward from 0% to 100% throughout the range of doses (50 mg every other day to 300 mg daily). In addition, the average number of injections per eye decreased with dose, from 2.6 injections for the 50-mg group to zero for the 300-mg group. in the 25 patients who completed the study, with no noticeable difference between them and the subset of 15 patients who required no injections. Of the six patients who were treatment-naïve, the downward trend in foveal thickness was about twofold (although the difference was not statistically significant). The safety profile of X-82 in this phase 1 study was generally good, and the drug was well tolerated. Six of the 10 patients discontinued treatment for symptoms judged to be possibly or probably drug-related, including two with leg cramps (50 mg daily), two with elevated transaminases (at 100 mg and 200 mg daily), and two with gastrointestinal symptoms at the highest dose (300 mg daily). This confirms the findings from a phase 1 study in cancer patients, in which the drug was well tolerated at doses up to 800 mg daily (unpublished). In summary, both refractory and treatment-naïve patients treated with oral X-82 maintained or improved visual acuity with few or no intravitreal injections. There were no dose-limiting toxicities. The safety and proof-of-concept improvement in OCT and BCVA outcomes were encouraging and supported the initiation of a phase 2 trial to further study this oral treatment for wet AMD. A phase 2 trial of oral X-82 at doses up to 200 mg daily (the APEX Study) is in progress.5 It is a randomized, double-masked, comparative dose trial with placebo control intended to find the most appropriate dose of X-82 for treatment of wet AMD and to observe its safety and efficacy for a full year. The trial seeks to enroll 132 patients, and it is running at 25 sites across the United States. Patients are eligible for enrollment if an eye has been treated for at least 6 months with an intravitreal anti-VEGF agent injected at a minimum of 8-week intervals. Additionally, eyes must be responsive to anti-VEGF injections, as demonstrated on SD-OCT by reduction, but not elimination, of macular edema or subretinal fluid. Patients will receive varying daily doses of oral X-82. Intravitreal anti-VEGF treatments will be administered as needed, based on SD-OCT evidence of increased macular fluid. At each visit, macular anatomy will be assessed by SD-OCT and measured at a central reading center. The primary endpoint is visual acuity, and secondary endpoints include the number of injections required and anatomic changes on SD-OCT.
A separate dose-escalation study of oral X-82 is being performed in China in cooperation with Anew Pharmaceuticals, a partner company of Tyrogenex. X-82 has shown promise as a potential oral therapy for the treatment of wet AMD in a phase 1 study. 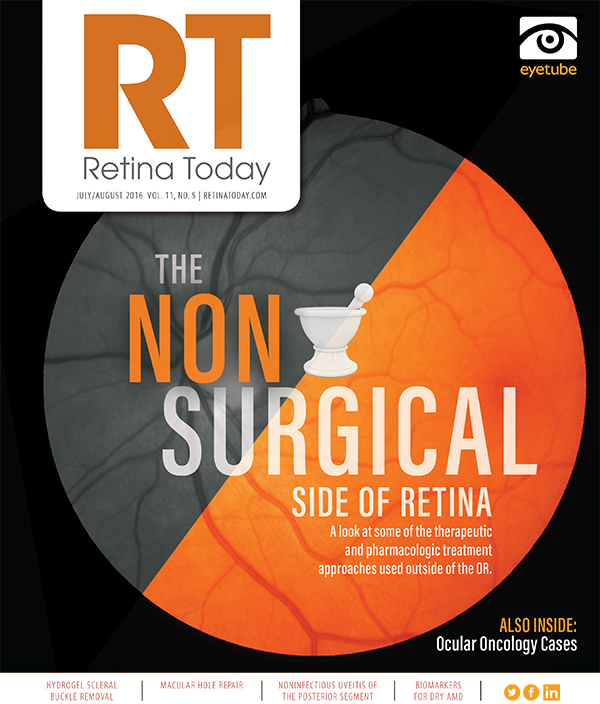 Treatment-refractory and treatment-naïve patients maintained or improved visual acuity and SD-OCT findings with few or no intravitreal injections. 1. National Eye Institute. Age-related macular degeneration (AMD). https://nei.nih.gov/eyedata/amd. Accessed June 9, 2016. 2. Chaudhry N. Oral VEGF receptor/PDGF receptor inhibitor X-82. Paper presented at: the American Academy of Ophthalmology Annual Meeting; November 14-17, 2015; Las Vegas, NV. 3. Jackson T. A phase 1 study of oral tyrosine kinase inhibitor (X-82) in previously treated wet age-related macular degeneration. Paper presented at: 15th Annual Euretina Congress; September 17-20, 2015; Nice, France. 4. Boyer DS; Ophthotech Anti-PDGF in AMD Study Group. Combined inhibition of platelet derived (PDGF) and vascular endothelial (VEGF) growth factors for the treatment of neovascular age-related macular degeneration (NV-AMD) - results of a phase 1 study [ARVO abstract]. Invest Ophthalmol Vis Sci. 2009;50:1260. 5. X-82 to Treat Age-related Macular Degeneration. https://clinicaltrials.gov/ct2/show/NCT02348359. March 22, 2016. Accessed June 13, 2016. • president of Tennessee Retina, PC, in Nashville, Tenn.